"un'ora segnata dal destino batte nel cielo della nostra Patria. L'ora delle decisioni irrevocabili." . 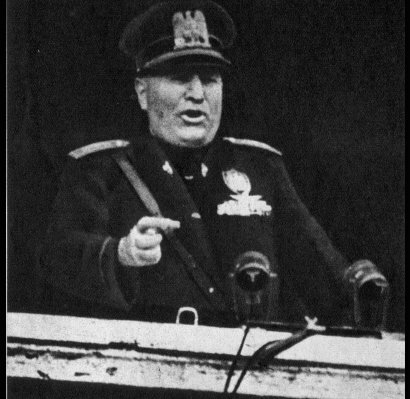 With this twenty seconds sentence Mussolini threw Italy and the Italians into a nightmare five years long. As the not very impressive start of the combats had put the Italian commands in deep frustration, units of the "Marmarica" division were immediately ordered to retake Ridotta Capuzzo. A few hours later, during the night between 15 and 16 June, a Libyan tactical group (one infantry battalion, two L-tanks companies, and one towed gun group) moved from Gabr Saleh with the aim of taking enemy by surprise. As a matter of fact there was a surprise, but not that we expected. 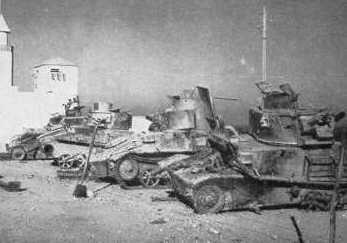 The Italian column was smashed by overwhelming armored forces (tanks and armored cars). 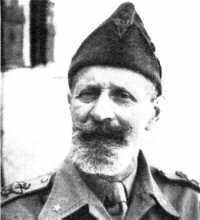 All the17 Italian tankettes were destroyed and the commander (Col. D'Avanzo, who was later awarded the first Gold Medal of the campaign) was killed in action. During the first two weeks of war the British, also benefiting of the better quality and quantity of their armament and supplies, continued with their aggressive conduct which further depressed the Italian generals. "... the only British division currently deployed has 360 between armored cars and medium tanks. There is no match for rifles and machine-guns, we will not, however, cease to fight and will make miracles; but had I been the British commander I'd already been in Tobruk..."
"Our assault tanks are old and, being armed with sole machine-gun, they are already obsolete: the British machine-guns mounted on their armored cars riddle them with bullets which fly across the thin armor of our tanks; we don't have armored cars, the anti-tank guns are usually old and non effective, the new ones lack adequate ammunition. Thus the combat becomes a sort of meat-against-iron-fighting..."
As promised, however, the Italians actually "made miracles" and, by "creating" original even extravagant anti-tank vehicles (e.g. : alpine troops guns 65/17mm towed on trucks, 20 mm anti-aircraft MG mounted on captured Morris armored cars..) they were able to relieve their first and second lines from the British pressure . gen. Badoglio answered to the Governor's request with the usual list of excuses ("...I do my best to let you have what you need", "...I constantly push the logistics responsibles", "...you will receive in Benghazi the new 70 medium tanks. They are magnificent"). Believe it or not, this last statement is, to me, the best example of why Italy, despite the gallantry and the indomitable valour quite often demonstrated by our soldiers, was (and will) never be able to win a war ! The Italian general Chief of Staff, the highest military rank, was bombastically blathering of less than one hundred M11/39, an indifferent 11 ton, badly armored and poorly armed medium tank. In the mean time Mussolini was urging on Balbo to launch the invasion of Egypt. On June 28 he telegraphed to the Governor of Libya to organize the attack by July 15 .... 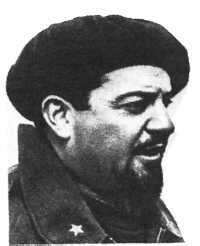 He never received an answer from Balbo because, on the same date, the poor Governor's aircraft was knocked down by the Italian AA guns while flying over Tobruk (this very efficient example of "friendly fire" is still one of the most obscure events of the Italian war) . 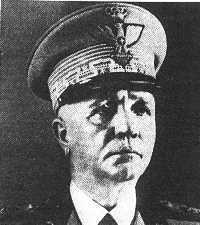 All he did, in fact, was the appointing of his deputy (gen. Gariboldi), the preparation of a memorandum for the High Command on the state-of-the-art of the local resources, and the presentation of a list of queries explaining why it was not possible to comply with the Duce's will. The exchange of memoranda and counter-memoranda continued for about six weeks, until Graziani received, on August 20, an ultimative diktat from Mussolini ... an offer he couldn't refuse! Each division consisted of five (for the Army Corps) or six ( for the Gruppo Div. Libiche) infantry battalions. Each tank unit (raggr.carristi) consisted of three tank battalions (one of M-type medium tanks and two of L-type light tanks). During the whole month of August a number of attacks and counterattacks, actually no more than skirmishes, were launched by both sides of the frontline. The seventy M 11/39 sent to Libya were not a match for the medium and heavy cruisers. The first time, however, they saw action (August 5, 1940), they had a better chance with the Mark VI light tanks. The order to advance was given on September 8, 1940 and the various units spent the next three days to reach their respective starting points. On 13 September, after a massive air bombardment and shelling, the Italians moved ahead, took Sollum in the morning and before night, under a heavy fire of the British artilleries and bombing raids, reached and kept the Halfaya pass. During the following days the Italians continued their advancing, fighting against the British forces as well as against the desert environment constraints. The British stubbornly defended their positions but the Italians, supported by the tanks of the Raggruppamento Maletti and by the 2.� Raggruppamento carristi, forced them to retreat and, on Sept. 16, 1940 took Sidi-el-Barrani. our Libyan troopers had to walk along dusty trighs with a limited reserve of water and supplies and a ground temperature of some 50�C. trucks and lorries, quite often not adequately prepared for use in extreme conditions, had been gathered at the very last moment from various sources and drivers hadn't been trained to operate as coordinated motorized columns. tanks (both M- and L-types) were not properly employed and, as they were forced to follow the troopers by moving on their own tracks, suffered an incredible number of failures (a M-tank battalion was left with only 8 efficient vehicles and, out of 52 L-type light tanks, casualties amounted to 35!). finally, air force, in general adequate, was not fully efficient for both lack of adequate training on cooperation with ground forces and for technical reasons. gen.Graziani, duly alerted by gen. Bergonzoli (CO XXIII Army Corps), reached the conclusion that our forces couldn't move further towards Marsa Matruh. Our units were, therefore, deployed all over the area going from Tobruk, Bardiah, and along the Egyptian border. The Italian success (I'm sorry for you, gentlemen, but that time we won! It was not a major victory...but it was a victory!) left a bitter taste in Churchill's mouth. He therefore decided, by taking a calculated risk, to arrange a naval convoy with tanks, artilleries, and other supplies detached from the British strategic reserves. The Commander in Chief of Middle East, gen. Wavell, then received a massive supply of modern materials, including 152 new tanks (50 of which were the heavy infantry tanks Matilda II), anti-tank and Bofors anti-aircraft guns, machine-guns and ammunition. Wavell immediately planned a counter-offensive but, due to the October 1940 Italian invasion of Greece, he had to divert to the Balkanian frontline a good share of his forces. Between October and December both the belligerents started major reorganization and training programs. In particular the British Corps underwent a hard drill program, which included long lasting day and night displacements, back and forth in the desert, focused to a fast 5-days raid (the "Operation Compass"). The military operations, however, never stopped during this period. On November 19, a British mechanized column, identified by the Italian air reconnaissance at Alam bu Hileinat (about 25 miles south of Sidi Barrani), was attacked by combined tank-mechanized infantry task forces detached from the "Raggruppamento Maletti" and from the 2. Libica division. The British, severely hurt by the combined impact of the three Italian columns moving from north, northwest and south with the support of the fighters of the Regia Aeronautica, couldn't do other than withdrawing but later, while the Italians were returning to their bases, launched their tanks against our rearguards. At the end of the combat the British had lost six aircraft (while all the Italian fighters landed safely) but the Italian armor confirmed its complete inadequacy to compete against the enemy's tanks. Elsewhere in Libya there were, still under fitting-out, the first new M13/40 medium tanks. During the night between December 8 and 9, 1940 the British attacked with the 4th Indian Division, with the 7th RTR, and the 7th Armored Division tanks the Italian strongholds from Sidi el Barrani to Sollum. At 7:00 am the British began a heavy shelling on Alam Nibeua, the "Raggruppamento Maletti" headquarters and then launched their attack. 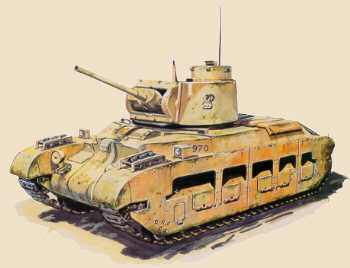 gen. Maletti tried to withstand the British heavy tanks by moving ahead his mixed tank battalion (two tank companies : one of L3, one of M11/39) but, since the MG.
and the 37 mm shells could just scratch, without piercing, the thick armor of the British Matildas, the result of the combat was the complete destruction of the Italian tank battalion and the fall of the camp. gen. Maletti was killed in action by a British machine-gunner. In the afternoon there was another tank combat around the Alam el-Tummar stronghold. Again, the all-L3 Italian armored unit (XV and IX battaglione carri L) was completely swept out. 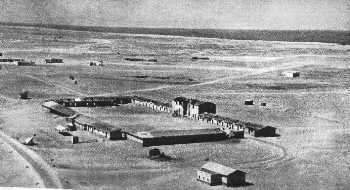 On December 10, 1940, in spite of the stubborn opposition of the Italian forces (including the troopers of the divisioni libiche) which caused severe losses on the British, Sidi el-Barrani was actually in the hands of gen. O'Connor. The remnants of the Italian 10th Army Corps (mainly the bulk of the "Cirene" and "Catanzaro" divisions) withdrew to Sollum and Sidi Omar. As the offensive was a such a great success, gen.Wavell, urged by gen. O'Connor, agreed to continue the advance. The attack to Bardia was carried out by the 6th Australian infantry division, supported by the 7th Royal Tank Regiment and, on a second line, by the 7th Armored Division. The action started at 7:30am of January 3, 1941, when the Australian pioneers cut the barbed wire entanglements with their bangalore and let 22 Matilda heavy tanks to enter within the defensive perimeter. The 12 Italian M13/40 medium tanks, and few L3 light tanks, supported by anti-tank weaponry, moved against the British tanks but the Matildas' armor was invulnerable to the 47mm shells. Once again the Italian tankers had to pay a terrible tribute of blood and tears to the poor quality of their armament. On January 5, 1941 the Bardia fortress was taken by the British who made a terrific booty : 32.000 prisoners, about 450 guns, 700 trucks, and 127 tanks. The final attack started at 8:00am of January 21, 1941 and was conducted in the same way as in Bardia (Australian infantry troopers supported by the heavy infantry tanks). Although the Matildas were reduced to 16 units, they outclassed all the Italian tanks, both the light and the medium ones. Twenty-four hours later, on January 22, 1941, the first battle of Tobruk was over. O'Connor, encouraged by the campaign progress, moved forwards his divisions aiming to Benghazi. The British forces followed two routes : one along the coast (direction : Derna, Cirene, Barce), the other straight through the desert. This latter led the British units (two armored brigades with not less than four tank and one armored car regiments) to a close encounter with the Italian armored brigade in El-Mechili. The combat was carried out in two phases : during the first the Italian brigade (with 57 M-type and 25 L-type tanks) got rid of the light MkVIs (10 hit, of which 7 destroyed); during the second phase it was the turn of the Italian M13s to become the target of the heavy infantry and cruiser tanks (8 tanks hit and destroyed). The last tank battle of the campaign was that fighting in Beda Fomm between February 5 and 7, 1941. In this location, south of Benghazi, the already mentioned two British armored brigades clashed with a second Italian armored brigade (about 100 M13 medium tanks). At the end of three days of furious combats, the British heavy tanks disposed of all the Italian tanks. 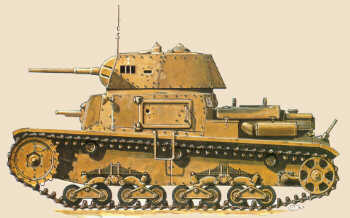 Apart from the poor quality of the armament (armor and gun) which had made the Matildas and the Valentines practically invulnerable to the M13s, the Italian armored units were disrupted because they failed to adopt the en-masse deployment strategy, burning hundreds of crews in short range combats conducted by small groups of tanks destined to one fate only : destruction ! Once again, a long line of burnt-out hulks, while proved the dramatic incompetence of the Italian High Command and the cynism of a regime which had sent thousands of soldiers to fight (and to die) armed only with the Duce's bombastic slogans, proved also the courage and the abnegation of the Italian tankers and troopers, who always accepted to risk (and quite often to lose) their lives in hundreds of hopeless missions. On February 12, 1941 the winning march of the British armored corps stopped in El-Agheila. 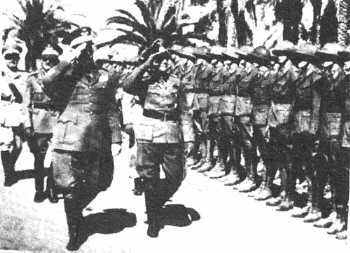 It had been a remarkable cavalcade which had kicked-off, in less than four months, the Italians from the Cyrenaica ... but the Fate was planning a nasty trick on the British hopes. ... but this is another story and will be treated in another page !